Configurable development platform compatible with all our modules. Featuring the down-pins female socket, the down-pins variants of the modules can be easily attached/detached to/from the base board, allowing for effective development on different SQM®4 modules. The board expands a high number of peripherals available on SQM®4 microcontroller/microprocessor module, whichever you choose. 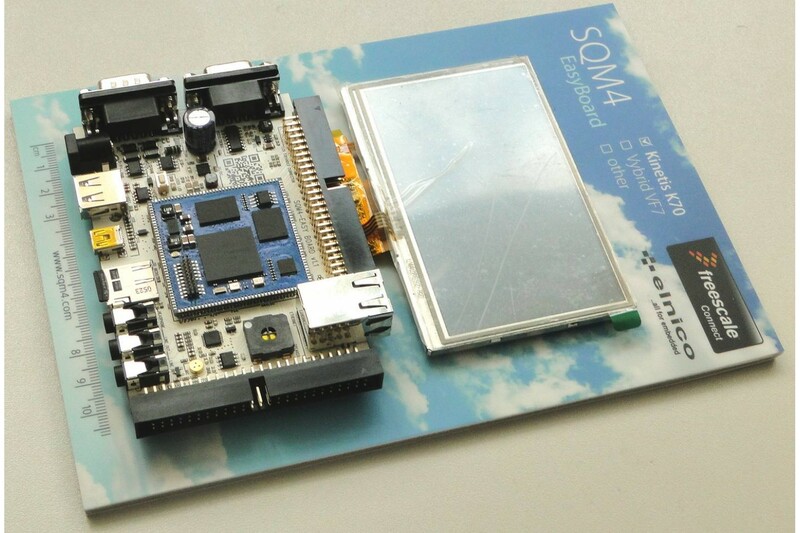 It provides the right way to start an immediate development of your own devices based on the SQM®4 modules. EasyBoard demonstrates in practise how use of SQM®4 modules rapidly simplifies and cheapens the whole development and production process because the base board can be so easy. YES, EasyBoard really is a two-layer only board! And since the number of peripherals in embedded applications is not usually so high, your device can be even simpler, fast to develop and cheap to produce. It can be so easy! Take advantage of our great offer and bundle additional products in the kit. You get 5% discount on each of them! Bareboard_SQM4_K70 Source codes and projects of some bare metal demo applications 2014-03-25 20:41:39 To download this file you must be logged! 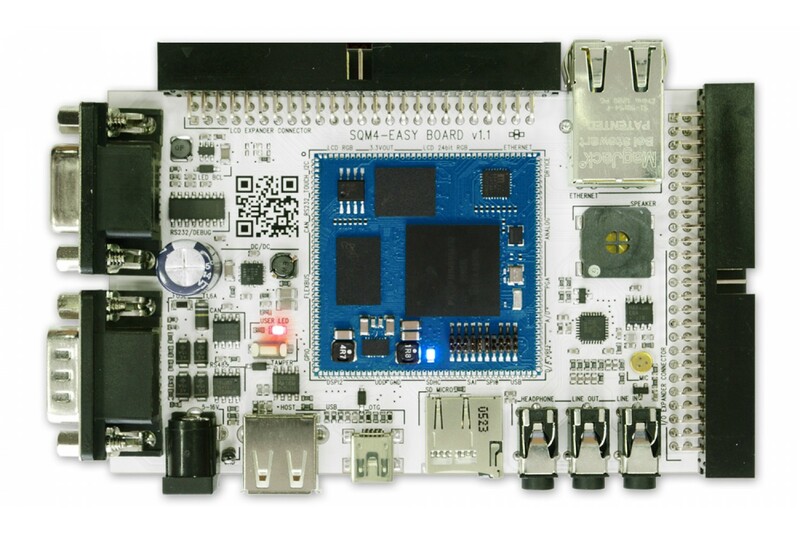 EasyBoard_datasheet EasyBoard datasheet 2014-03-25 20:32:07 To download this file you must be logged! EasyBoard_sch EasyBoard schematic 2014-03-25 20:33:43 To download this file you must be logged! eGUI-distrib eGUI library distribution build projects for IAR and CodeWarrior IDEs. 2014-10-16 12:14:34 To download this file you must be logged! MQX402_SQM4_EB_v22 EasyBoard 2.2 BSP patch to the MQX 4.0.2. Supports SQM4-K70 and SQM4-VF6 processor modules. 2014-11-26 14:38:46 To download this file you must buy this product! MQX411_SQM4_EB_v22 EasyBoard 2.2 BSP patch to the MQX 4.1.1. Supports SQM4-K70 and SQM4-VF6 processor modules. 2014-10-02 23:13:54 To download this file you must buy this product! MQX420_SQM4_EB_v22 EasyBoard 2.2 BSP patch to the MQX 4.2.0. Supports SQM4-K70 and SQM4-VF6 processor modules. 2015-10-13 10:32:56 To download this file you must buy this product! SQM4_VF6_v22_SCH Full schematic of the SQM4-VF6 v2.2 modules 2014-05-02 13:01:03 To download this file you must buy this product! SQM4_ZY7_schematic Full schematic for SQM4_ZY7_v10 2014-04-09 21:00:13 To download this file you must buy this product!